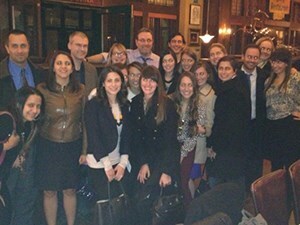 Current interns and graduates from all years meet up each year at the ABCT convention. Who is eligible to apply to your internship? This internship is only available to students enrolled in doctoral programs in Health Service Psychology and/or Professional Psychology, in the areas of (a) clinical, (b) counseling, (c) school, (d) other developed practice areas, or (e) combinations of two or three of the above areas, consistent with the standards of an Eligible Accrediting Organization (one that accredits doctoral programs in Health Service Psychology and/or Professional Psychology and is either recognized by an Approved Government Agency or the Canadian Psychological Association). An Approved Government Agency is a United States governmental department, agency, or body that (a) formally reviews and/or recognizes doctoral psychology accrediting organizations or (b) has explicitly recognized a doctoral psychology accrediting organization in its hiring qualifications; and (c) has been approved by the Association of Psychology Postdoctoral and Internship Centers (APPIC). Approved Government Agencies currently include the United States Department of Education and the United States Department of Veterans Affairs . Respecialization programs in Professional Psychology for which internship is an essential and required component of the doctoral training are also eligible. Over the past five years, our site has averaged 380 applications for our 8 positions (we have received the most applications in the match in 3 of the last 5 years)! May I apply to more than one track? How many applicants do you interview and how do you decide? We typically select approximately 15-20 applicants to be interviewed in each of the specializations. Selections are made based on a review of the entire AAPI Online. We recognize and apologize in advance that there will be many excellent applicants each year who are not invited for interviews. We are committed to a policy of equal opportunity and make all employment decisions based on the ability and qualifications of the individual applicant to perform the job and, as such, we do not discriminate on the basis of race, color, creed, religion, national or ethnic origin, gender, sexual orientation, gender identity or expression, age, disability, marital status, veteran status, genetic predisposition or carrier status, alienage, citizenship status, or any other legally protected category. Members of under-represented groups are especially encouraged to apply. The core training sites for the Psychology Internship Training Program are located in or around Montefiore’s Moses Campus in the Norwood section of the Bronx and Wakefield Campus in the Wakefield section of the Bronx. Contrary to the Bronx's reputation in movies, our neighborhoods are beautiful, historic, and safe. In fact, the Moses Campus is adjacent to Van Cortlandt Park, the fourth largest park in New York City. We are easily accessible by car (parking is available at a cost), subway (just a 30 minute subway ride from Midtown Manhattan), and express bus. What job benefits are offered? In addition to the current stipend of $42,900, interns receive full medical and dental benefits with a range of choices, as well as 20 vacation days, 12 sick days, 8 hospital holidays, and up to 5 conference days. Interns also receive up to $2000 in conference support (if presenting), $16.85 per day, (6 days/week) to supplement the cost of meals, and a $500 educational allowance that can be used toward textbooks, membership dues, software, PDAs, iPads, e-readers, etc. Interns may also apply to our subsidized housing, but please note that it is highly competitive and therefore cannot be guaranteed. Do you accept half-time interns for a two-year program? No. The internship is a one-year, full-time (approximately 45 hours per week) training program. Are the current interns satisfied with the program? When you are invited for an interview, you will have an opportunity to speak with our current interns about their experiences here, and to follow up with them at a later time. You may also want to contact any of our program graduates and ask them about their experiences here. We ask our interns to formally evaluate the program at the end of the year across all areas (supervision, rotations, didactics, etc.) and our interns uniformly rate our training program as excellent and report being very satisfied. They frequently comment on being particularly impressed by the high quality of supervision, the intensity of the clinical training and the flexibility of the training program to meet their specific professional development needs. In addition, when survey distally, all of our interns from the past decade replied and 100% stated that they would recommend our internship. Are child and adolescent track and combined track interns allowed to treat adult patients, and are adult track interns allowed to treat children and adolescent patients? Yes. Interns essentially create their own roster of patients from among the entire list of ambulatory clinics. Are child and adolescent track interns allowed to do an inpatient or psychiatric emergency room elective? Yes. However, since the inpatient psychiatric emergency room rotations require a nearly full-time commitment, the intern's outpatient case load would need to be significantly reduced during that time. Thus, these electives are typically planned for the last month of the internship year (June) in order to avoid unnecessary interruptions in the treatment of outpatients. Do interns in the adult track treat outpatients during their psychiatric emergency room and addiction psychiatry consultation service in psychosomatic medicine rotations? Yes. Interns will have the time to treat two or three outpatients during those rotations and are encouraged to see outpatients throughout the year, in order to gain experience in long-term outpatient care. Can interns continue to treat patients who they have been seeing during their graduate training? It is possible, however, these patients would need to be registered in our outpatient clinic, and be seen on-site. Our clinics accept only certain insurances, insurances however, so their insurance coverage cannot be guaranteed (although, we also have a sliding scale policy for self-pay patients). Do interns have an opportunity to participate in research? Yes. As of the 2019-20 internship year interns in all three tracks will be required to participate in research for a minimum of one day/week for 4 months, during the internship year. The psychology faculty at Montefiore are actively involved in research and willing to mentor interns in number of different areas, including: anxiety and depression, personality disorders, behavioral health services utilization, psychological assessment, cognitive behavior therapy, dialectical behavior therapy, adolescent suicide, and eating disorders. Interns have historically participated in all aspects of research from study design and literature review, to subject recruitment and data collection, to data analysis and dissemination of findings. Interns frequently present data at scientific conferences, and have served as first authors and co-authors on numerous scholarly papers and book chapters. For a summary of the faculty publications, presentations, and workshops on which previous interns have participated, click here. For a list of research mentors and their areas of research/interest, click here. For more information about the Psychiatry Research Institute at Montefiore Einstein (PRIME), click here. Do interns have access to computers and the Internet? Yes. Every office has a computer with high-speed internet access and all interns are assigned a hospital email address. The Department of Psychiatry uses an electronic medical record and interns are expected to record all progress notes and treatment plans electronically. Do interns succeed in finding employment after the internship year? Yes. Although the job market is highly competitive, graduates of the Montefiore internship have an excellent track record of finding initial employment. Many graduates are recruited into clinical and research staff positions at Montefiore or its affiliated institutions. Our interns are marketable, in part, because they have developed special clinical skills (i.e., neuropsychological assessment, cognitive behavior therapy, dialectical behavior therapy) and worked with unique populations (suicidal adolescents, AIDS patients, anxiety and depressed patients, and substance abusers). Click here for a list of our program graduates and the postdoctoral positions they have taken.